1. Stronger customer relationships. Conversations about insurance products often reveal customer insights and details that may uncover the need for other financial products. Customer loyalty increases as the number of products owned increases. Customers already trust the institution to keep their money safe. Leverage that trust by protecting their financial security as well. 2. Enticing revenue opportunity with richer profit margins. The compensation for Disability, Life and Long-Term Care insurance is very attractive. First year commission may be as high 100 percent of premium and up to 15 percent for renewals. Compensation varies by product and carrier. 3. Customer-suited products. Product offerings are tailored to the needs of your customers, making for a smooth conversation transition from banking to financial products. DI, Life, and LTCi are fundamental to financial security, a natural fit with banking. 4. Differentiation from competing institutions. Attracting new customers with state-of the-art self-service tools, ironically makes it difficult to build a business relationship. Our suite of products provides essential financial protections that open avenues to develop a customer relationship that is difficult for a competitor to replicate. 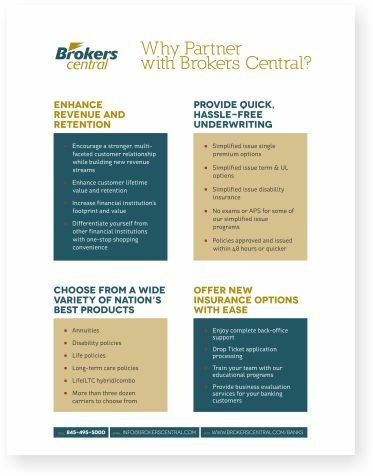 The Brokers Central arrangement puts the spotlight on the financial institution. Customers see only expanded services. We work in the background to ensure a smooth application, underwriting, and policy issue process. Our expertise also covers training the sales team to be knowledgeable about the products and confident in their recommendations. Our training program emphasizes empowers your team to speak with customers confidently while focusing on the customer relationship, not the product. We realize establishing the connection and building trust is the cornerstone to success. 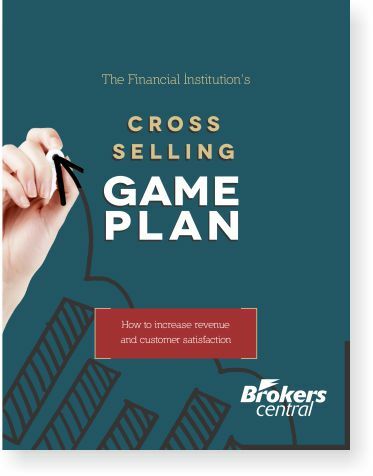 To learn more, download our Financial Institution Game Plan now or our “Four Secrets to Financial Services Cross-Selling Success” Fact Sheet. You can also contact us to discuss your unique situation any time.